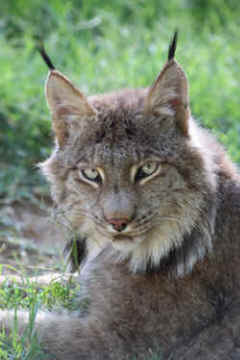 Meet Rufus and Misha, a brother and sister pair of Canadian lynx that arrived at PAWS in June and are currently living at our Galt sanctuary. The pair had previously resided at Storybook Gardens in London, Ontario, Canada. As part of Storybook Gardens' 2008-2010 business plan, the City Council had approved the reduction of the overall size of the zoo component of the park, with the eventual goal of closing the zoo operation all together. The only animals that would remain would be the domestics. Between 2009 and 2011, suitable homes were identified for a number of the animals and more than half of them were transferred to zoos and animal sanctuaries in Ontario, Quebec, and New Brunswick. Throughout the process Storybook staff worked collaboratively with local animal welfare groups to select appropriate new homes. The community group Friends of Captive Animals (FOCA) endorsed Storybook's proposed plan and Zoocheck, an animal welfare organization based in Toronto, was instrumental in the relocation process. Rufus, Misha and the other remaining animals at Storybook Gardens have a big name to thank for picking up most of their relocation tab. According to officials at Zoocheck, Bob Barker, retired host of "The Price is Right", paid much of the estimated $120,000 it took to place the remaining animals in new homes. 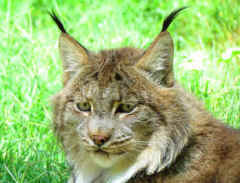 Of the animals remaining in 2012, four harbor seals were sent to the St. Louis Zoo, the birds of prey went to Sandy Pines Wildlife Sanctuary in eastern Ontario, two beavers and an otter moved to Aspen Valley Wildlife Sanctuary near Rousseau, Ontario, and the two lynx came to PAWS. The pair have settled in nicely and seem relaxed in their new home. Welcome Rufus and Misha, and thank you Storybook Gardens and everyone involved in the relocation.